The carefully selected items included in this widget are the product of over six years of full-time travel; going from one main destination to another with a larger entourage, and then traveling for up to three months from each base with just carry-on luggage. I started with mountains of useless gear and utilitarian clothing, and gradually — through experience — whittled the contents down, and now my carry-on packing list is a well-oiled, well-coordinated machine. Click on any of the items and you'll see a description of why and how it fits into my carry-on packing list. Within each description is even a link that takes you to the item itself, so you can see descriptions and reviews. Play around with the different category filters so you can more easily navigate the list. I don't carry all of these items — even I'd be hard-pressed to fit it all in. This carry-on packing list is flexible for multiple climates and scenarios. You'll see a number of items in the "Optional" filter — your need for these are dependent on where you're going and what kinds of activities you intend to do. If you're the outdoorsy type and are headed for Switzerland, then you'll have your down jacket, warm scarf and hat, and sturdy shoes with hiking socks. If you're city-slicking through Paris in autumn, you can leave the big shoes behind and stick to your ballet flats, but bring a fashionable scarf for chilly evenings, that funky fedora, and your DVD drive. Everybody travels differently, so not every item on this list may resonate with you. And fellas — I realize this is a pretty girly list, but if you can see past the fashion choices and toiletries to the core structure of this packing list (including various functions of clothing and shoes), I believe it's a universally applicable list. Weight guidelines for carry-on bags vary by airline and route, and some budget airlines are pretty stingy. Depending on how much warm-weather clothing (and other "optional" items) you have, plus the weight of your electronics, you might have difficulty getting this packing list through. The OR compression sack I carry might not be the absolute best choice for a carry-on bag (the backpack straps are solid but not beefy) — but it does a pretty fine job for me. It's part of my larger full-time travel packing list, so I can fill it using the compression straps to keep volume low, and pack it into my larger bag when I'm moving bases. The is so light and thin it takes up very little room of its own. You might instead prefer to purchase a more traditional carry-on sized bag (maybe with wheels) that enable easier transport and access to contents. What's on Your Carry-On Packing List? Okay, I've showed you mine; now you show me yours! How do the contents of your own carry-on packing list differ from mine? Got any hot tips for useful items that I didn't include? Tell us in the comments! 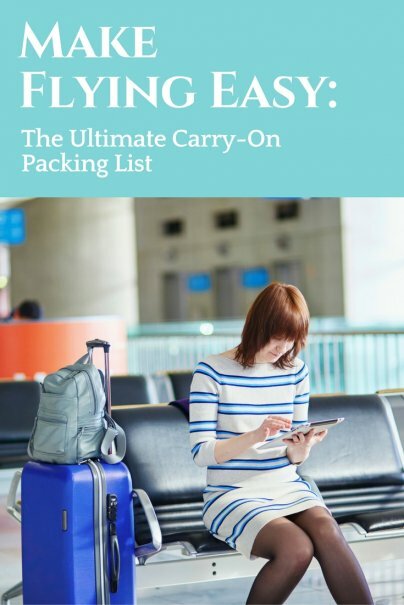 This ultimate carry-on packing list widget was courteously designed and provided by Round the World Experts, who provide round the world flights to adventurous travelers, and there are some affiliate links in the widget. As I have purchased most of these exact items myself, all opinions are obviously my own. The timing on this list is impeccable! I'm getting ready to pack for a trip to Italy and was getting overwhelmed. Can't wait to try this app! I've got a question really. The toiletries here look like they exceed the 50ml for liquids carry-on rule that applies globally. How do you get these through customs with your carry-on luggage?